We were pleased to sponsor again the Open Maiden Race in the South Pembrokeshire Hunt Point to Point Races, which were held at Lydstep on Easter Monday. 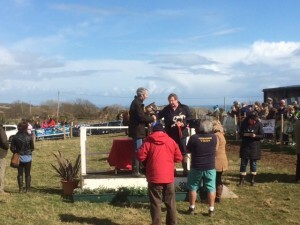 The winner of the race was Sandeel Bay and Mr Adam Bruce of Ungoed-Thomas and King is pictured below presenting the trophy to the owner Mr D Rees of Tivyside Club. Have you drawn up a Disaster Recovery Plan for your farm? Do you own property or assets in Europe?